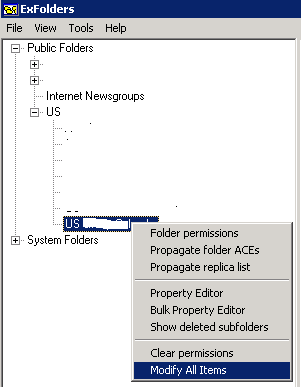 The new public folder database was not getting all the existing public folder replicas/content. Have you added all the replicas (or the ones you need) to your new public folder database? 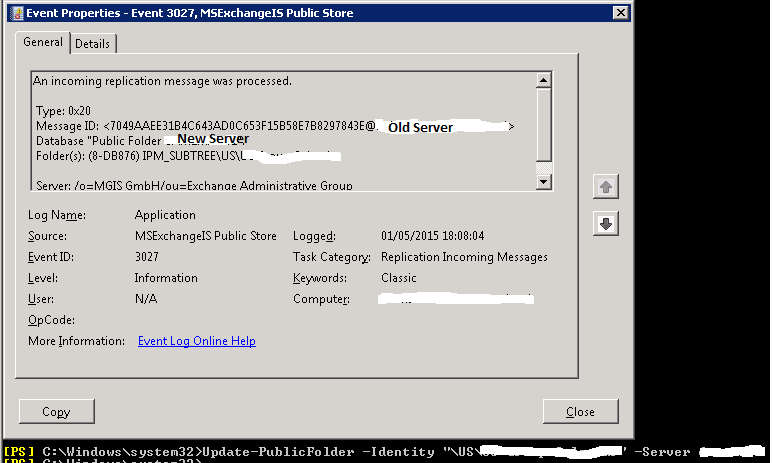 The script above is on the Exchange scripts folder, and can be ran from an Exchange Management Shell. Look here for more details on the script. Is the above done and your public folder database is still not up to date? If you do have the replicas pushed to the new server, and the content is still not being replicated, then please also check if the mail flow between the source and destination server is working. In my case of course it was working, because as stated on the title of this post, only the old content of the public folders was not being replicated. New content was fine, which means that issues like mail flow or invalid replicas were ruled out. 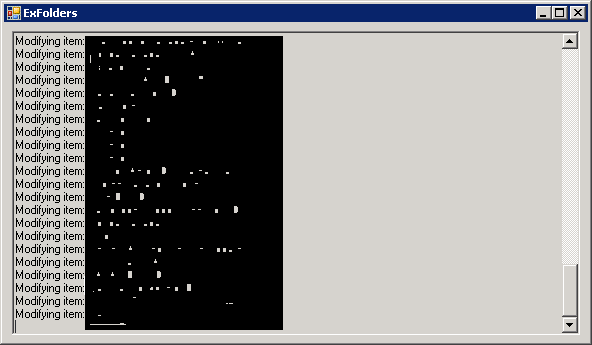 UserA was connecting to a database on the new server that was using the new public folder database. Via OWA UserA opened the Public Folders, and created a new item. 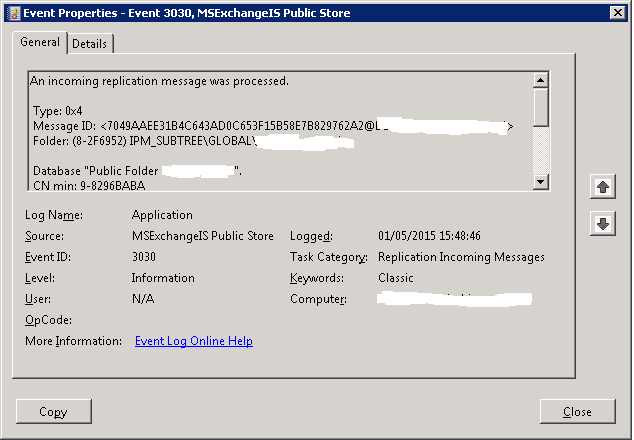 The item was replicated to all the Public Folder databases on all servers. UserA can only see a very limited number of items on the Public folders, all recent and created after the creation of the new PF Database. The Public Folder “US” had zero items in the new server and 1087 on the old one. An item created now would replicate to both the new and the old server, but nothing was happening to old content. Now before I continue, it´s mandatory for me to recommend you read an excellent Public Folder Troubleshooting article from the Ehlo Blog. The next step is to raise the event log level on both the new and the old server. 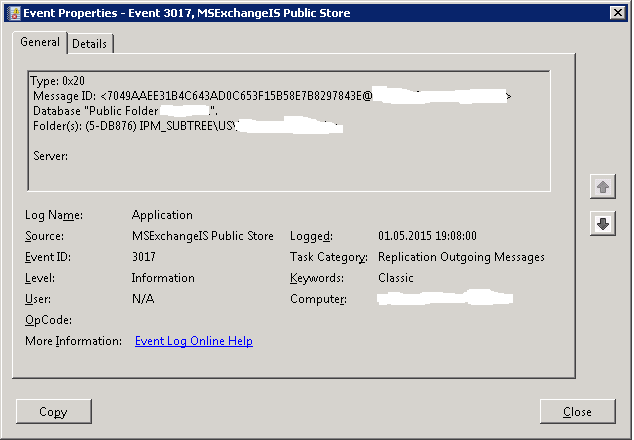 The logs you need to set to expert are under the “MSExchangeIS > 9001 Public” and are named “Replication Incoming Messages” and “Replication Outgoing Messages”. 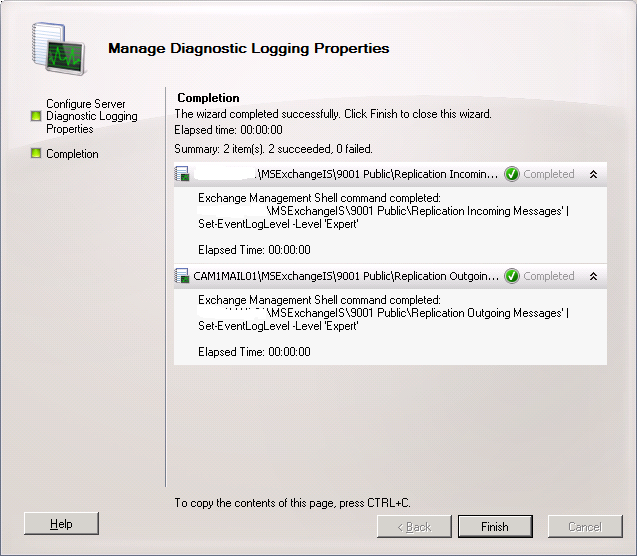 And on the new server event viewer you can see the 0x20 Status Request event (see the troubleshooting guide provided above for more info on event codes). But what you never see is an event like the one below, with status 0x4 that indicates that content is being replicated. So what is the solution? Update all the content using the ExFolders tool. Click here to download it, and for full instructions on how to run it. Once you have the Exfolders opened and connected to the old server, select the folders you want to update (in my case I selected the route because I wanted to update all) and click on “Modify All Items”. IMPORTANT NOTE: This will cause a replication storm, which means that all public folders on all databases will be updated and replicated. If you have a large public folder infrastructure you might want to consider doing this procedure during off work hours. You will then see the folders being updated. And once that is done, wait for the replication to take place and run the public folder statistics cmdlet again. Hope that the above was helpful..